Tim Banks.ca "run, if you can't hide": Members galore... something smells! A new mink farm in Springton was built to keep the smell down and animals in, says one of the farm’s owners. Wade Peconi and his business partner Ryan MacPhee appeared at the Island Regulatory and Appeals Commission Wednesday in defense of their farm after an area resident appealed their building permit. Peconi was responding to concerns from local residents who worried about the potential smell from the farm’s mink manure. But Peconi, who owns another mink farm in a different location, told the commissioners he lives next to it and also owns a dead livestock facility across the road, which is where any smell was coming from. “I don’t have an odour issue,” he said. Allistair MacIntosh launched the appeal on behalf of Stanchel and Springton residents who were opposed to the new mink farm, including 104 people who signed a petition that was sent to Environment, Energy and Forestry Minster Richard Brown. “So basically this told me and a lot of other people that this wasn’t wanted,” MacIntosh said. During his opening remarks MacIntosh read e-mails from one resident who raised birds and worried mink would get loose and kill them, while another was concerned about the loss of property value, the smell and water contamination. Peconi told the commission the farm is state-of-the-art with a concrete floor and trough system under the cages so manure can be collected in tanks for daily disposal. Once the farm is up and running it will house 2,000 breeding females from December to March at which point the mink will breed and produce between three to six young that will eventually be gassed and shipped to Nova Scotia for processing. The farm buildings also have steel walls buried into the ground and backfilled, which means that a mink would have to escape from its cage and run out the door when someone was entering or exiting the building in order for it to get loose and every aspect of construction exceeds industry standards, Peconi said. The commission also heard from Canadian Mink Breeders Association president Peter Peters who is supplying the farm with its mink and praised the quality of the facility. “This is the most modern type of farm in North America,” he said. Provincial property development officer Lou-Anne Wolfe appeared as a witness for the Finance and Municipal Affairs Department, which issued the building permit, and said the farm exceeded setback regulations from the road and a nearby stream with all Planning Act regulations followed. “We’re well within all of the regulations,” she said. But when it came to the petition, Wolfe said it had no bearing on whether or not a building permit was issued because the farm is in an unincorporated area and met the guidelines of the Planning Act. “I did what I had to do in the framework I had to work with,” she said. 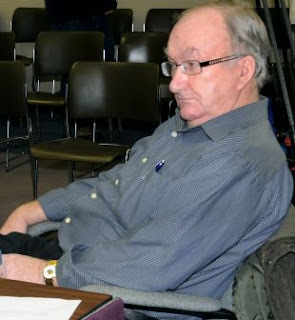 Environment, Energy and Forestry environmental assessment officer Jay Carr also testified that he received about 25 to 30 phone calls and a few e-mails from area residents who were concerned about the new farm, which he tried to dispel as unfounded. “The very bulk of their concerns were odour related and the release of animals,” he said. MacPhee told the commission that when he decided to open the mink farm he wasn’t planning to go in and ruin the community. “It’s a tough way to start in the community and I never intended this,” he said. The hearing wrapped up Wednesday afternoon with no date set for release of a ruling. So much for that Resolution! Yikes!!! maybe "Wes the Cat"
Don't lose any sleep... I'm not! Pee-wee Newest Adventure.... very funny! SHOCKING NEWS... so why not me!!!! Broken Resolution... I say NO.